HMS Dreadnought was one of the most important warships in history and the most important ship of the late 19th Century. She was so significant that navies were forced to describe their battleships as ‘pre-dreadnought’ or ‘dreadnought’. At the time of her design, the Royal Navy was the most powerful navy in the world and had reigned supreme for almost a hundred years. If Dreadnought had marked the height of British ship design she would be a suitable epitaph for the Royal Navy as is began to move towards decline. Perhaps the most remarkable aspect of the Royal Navy is that even after British politicians have done everything possible to ensure that it declines to a minor coast defence force, it is still capable of innovating and designing outstanding new warships. DESCRIPTION: HMS Dreadnought was one of the most important warships in history and the most important ship of the late 19th Century. She was so significant that navies were forced to describe their battleships as ‘pre-dreadnought’ or ‘dreadnought’. At the time of her design, the Royal Navy was the most powerful navy in the world and had reigned supreme for almost a hundred years. If Dreadnought had marked the height of British ship design she would be a suitable epitaph for the Royal Navy as is began to move towards decline. Perhaps the most remarkable aspect of the Royal Navy is that even after British politicians have done everything possible to ensure that it declines to a minor coast defence force, it is still capable of innovating and designing outstanding new warships. The Royal Navy continues to innovate and produce world-leading warship designs. After Dreadnought set the design standard for big gun warships, the RN developed the aircraft carrier to displace the big gun battleship as THE capital ship. Submarine designs set new standards. After 1945, the RN shrank dramatically in size and the RAF made concerned attacks in an attempt to seize naval aviation, then working to diminish it when the Royal Navy succeeded in retaining control of naval aviation, with the exception of shore-based maritime patrol. The Invincible Class mini-carriers with their Sea Harrier VSTOL fast jet strike fighters and Sea King helicopters kept the RN alive and made possible the liberation of the Falklands from Argentine crooks. RN nuclear submarines have maintained an independent and credible nuclear deterrent for Britain and nuclear attack submarines have set the standards for silent operation and produced the one sinking since WWII of a major big-gun warship when a British attack submarine sunk the Argentine heavy cruiser that was attempting a sneak attack on the British Falklands liberation force. Dreadnought was not therefore destined to become the last gasp of British naval design skills, but it is unlikely to be matched in its impact on naval design and tactics. This new publication from Anova Books, under their highly respected Conway imprint, fully matches the very high standard set by the Conway ‘Anatomy of the Ship’ series. Being released in a soft back binding, a £30+ book is available at half the price, making it affordable to a much wider readership than the prime target market of naval professionals, naval enthusiasts, model makers and model engineers. There is concise and effective text that will meet the needs of experienced enthusiast and naval novice alike, but the power of the book is in the outstanding and highly detailed drawings and the many rare photographs that provide a remarkable expose. The front and back covers fold out to reveal 1/32 and 1/16 scale drawings of the whole ship. For any model maker who is experimenting with 3D printing, these drawings could provide the basis of the 3D drawings from which the printer will be driven. For traditional model making and model engineering, these large drawings are of a scale and crisp detail to produce a set of construction drawings to any scale and therefore be warmly welcomed by those building large scale display and competition models of what is arguably the best known warship around the world. The photographic section shows Dreadnought under construction, afloat alone, and afloat in company with other warships. The captions to the photographs are concise but adequate to the purpose. As with the introductory text, tables and reference lists, the captions provide a great deal of significant information in a small space. It is very difficult to do full justice to the drawings in a review that is produced as text. Every aspect of the ship is displayed in drawings of the highest quality, accuracy and declared scale, even down to drawings of the officers’ cabins and the ship’s boats. One important inclusion is a set of drawings of the fire control table. This mechanical computer provided a new level of accuracy in controlling the fire of the 12 inch main armament. Although the motivations may have been different, Charles Babbage built his computing engine under Admiralty funding and his work not only laid the basis of the British development of the electronic digital computer, but it earlier laid the basis for mechanical fire control computers. In addition to this important component, a full set of drawings for the Barr and Stroud optical range finders are included, providing a complete coverage of the fire control. The ship’s boats are covered with a set of drawings at 1/8th scale, from the 50th steam pinnance, 45ft steam pinnace,42ft sailing launch, through the open sailing/pulling boats down to the 16ft dinghy. 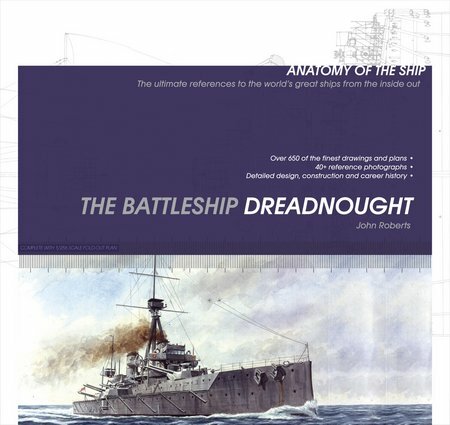 At 1/8in = 1ft, these drawing provide the level of detail to produce individual large scale models, or a allow a full set of much smaller scale boats to be built as part of the fixtures, fittings and accessories on a scale model of HMS Dreadnought. For any enthusiast, from novice to skilled, this book provides a full description of this most important warship. All of the questions raised, and left inadequately answered by other books that rely largely on text, about this iconic vessel, are fully dealt with. It is possible to work through the drawings, even without any great knowledge of engineering drawings, and see how each of the elements of the ship fit together. That this has been achieved in a book with a recommended retail price of less than £17 is amazing. It is reasonable to ask why HMS Dreadnought is so important in naval history. From the race-built galleons of the Elizabethan corsairs, to Nelson’s HMS Victory, design was a relatively slow evolution. The hull was based on keel and frames in wood. Later in the period, the size of battleships had increased significantly from the first race-built galleons, but the basic construction and design was very similar. The main armament was of varying sizes in any warship with more than one deck of guns. The heaviest guns were sited on the lowest gun deck. Each deck above carried progressively smaller carriage guns, mounted on a four wheel truck. On the upper decks, in Nelson’s day, it was common to carry slide-mounted Carronades or ‘smashers’. The very short barrel large calibre guns were intended to provide devastating close quarters fire when the battleship closed the enemy prior to boarding. After Trafalgar in 1805, battleship design to not change greatly. Even towards the end of the 19th Century, many navies still operated wooden warships with a broadside armament that was truck and/or slide mounted. The main innovation was the installation of simple steam engines that were still subordinate to sail and equipped with propellers that could be retracted to reduce drag when under full sail. From the 1820s, steel plate was introduced as armour, usually to cover only the most sensitive parts of a warship. By the 1860s and the American Civil war, steam power and armour became more common. The Confederate Navy rebuilt a frigate as a steam-powered vessel with a sloping superstructure and thick armour plating, but with a broadside armament of heavy guns. The Union Navy answered with the ‘Monitor’ that had dangerously low freeboard, looked more like a submarine on the surface than a big-gun warship, and mounted two large calibre muzzle-loading guns in a turret amidship and a full 360 degree field of fire, uninterrupted by significant superstructure. When they met in battle, these two ships were unable to achieve a decisive victory one over the other and their sea keeping abilities made them unsuitable for large scale production to replace sailing battleships. During the rest of the 19th Century, navies modified battleship design in a slow evolutionary process that saw armour plating applied over wooden hulls and steam power gradually replacing sail as the prime motive force, eventually displacing sail entirely. Guns were increasingly mounted in barbets or turrets, but their fields of fire were hampered by superstructure of increasing size and sophistication and the masts that were stubbornly included and still able to carry sail. By the late 19th Century, the use of steel frames to replace wooden frames, and the move to completely replace wooden planking of the hull had enabled architects for the first time to design battleships without the size limitation imposed by wood as a structural material. Reciprocating steam engines were by then reliable for blue water operation and navies has established coaling stations to ensure the viability of long voyages. The first fire control systems were also being implemented and voice pipes were augmented by the early telephones. Most guns were now mounted in sponsons or turrets, but the typical battleship had a mixture of different types and sizes of gun, including open mounts, and with only a small number of guns able to bear on any given target heading. In a stroke, HMS Dreadnought changed all of that and rendered all existing capital ships obsolete. Extensive armour up to 8in thick provided excellent protection against the heaviest guns then in use. A double bottom formed a key part of the hull design. The steel framed, steel plated hull of 490ft provided good sea keeping and low profile. Steam boilers of 220psi delivered steam at the engines at 210psi. After trials, steam pressure was increased to 241psi and 221.5psi respectively. The new steam turbine was employed to provide a considerable increase in efficiency. Electric power was provided by steam generators but also by diesel powered generators. The principle armament of 8 new 12in MkX, 45cal guns, with 6 guns able to bear on a broadside. Initially, 27 12pdr guns were provided on pin open mounts for practice use and for defence against torpedo boats. Most significantly, Dreadnought was equipped with optical range finders and a mechanical computer to provide a highly effective fire control system. The result was that she could out gun and out perform any existing battleship and absorb incoming gunfire with her extensive armour. This book is a book that no professional or enthusiast can afford to be without.